Sealpave is a name synonymous with quality and professionalism. Located in Battle Ground Washington, this Washington based company has been in the business of asphalt maintenance for more than 20 years now. You will find that our professionals have only your best interests at heart. We are a fully licensed, certified and insured company. Our service include asphalt paving, asphalt repair, asphalt crack repair, paint striping and seal coating. What makes us a cut above the rest are our professional services at competitive and affordable prices. Our state-of-the-art equipment and skilled expertise, that is the result of many years of experience in this field, is what sets us apart from our competitions. We have a long list of satisfied customers as we believe in not only offering the best services but also keeping good relations. Our company works hard to serve as to exceed your expectations on both residential and commercial projects. For the Sealpave team, every project is important, no matter if it is a small asphalt repair job or a big seal coating project. We put in the same level of diligence and are very capable of handling small as well as bigger projects. Our team can handle the largest of parking lots as well as the smallest driveway. Armed with the right technical skills and latest equipment, our experts can get the job done in a timely and professional manner and well within your budget. Our team remains dedicated to bringing customer satisfaction as well as quality and integrity to the asphalt maintenance field. We can offer you references and help you get in touch with our past customers. Please feel free to call us and get in touch with our customer care with any questions. Asphalt’s remarkable strength, durability and cost effectiveness makes it the material of choice for most paved parking lots and driveways. Sealpave will help you come up with the proper pavement plan through site inspection, your needs and budget. This information will enable us to come up with an effective design for your parking lot or driveway in a manner that is most cost effective. Whether you are looking for asphalt paving on your commercial premises or around your residential property, we use a very systematic approach to ensure that your asphalt will last as long as possible. Asphalt paving requires a design that takes into account the area of the site, nature of the ground, soil type and drainage. We also take into account the purpose you will be using the asphalt for, your specific needs and also the budget. It is only after meticulous assessment of all these factors that we offer a quote to you. Asphalt erodes over time and can develop cracks and it will also begin to fade or deteriorate in color. Water can then seep into asphalt holes and cracks and may freeze and expand, causing the surrounding asphalt to crack and break and it's inevitable that larger cracks and pot holes will start forming. Asphalt surfaces, however, can be repaired. 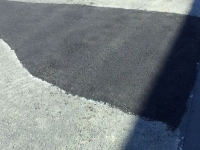 Asphalt can be patched using two different methods: surface patching and removal/replacement patching. 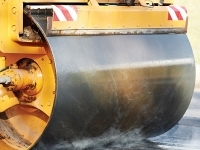 Surface patching involves asphalt-based glue being spread over the affected area, where hot asphalt later gets applied onto the damaged surface. This method is the most inexpensive, thanks to its simplicity. Removal/replacement asphalt repair is considered a more permanent repairing method. It's used when the asphalt suffers a significant amount of damage. The damaged asphalt is removed by cutting the eroded asphalt away from the healthier foundation. After leveling of the area, fresh asphalt is added to the area. Sealing cracks in your asphalt is a vital measure in protecting your pavement while ensuring a safe and attractive lot. 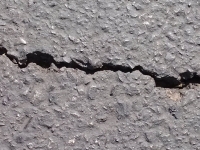 Asphalt crack repair is very important. Left as they are, cracks in your asphalt will not only get bigger, they will also lead to even bigger problems down the road. One of the main reasons for that is that cracks allow moisture to work its way beneath the surface of your asphalt, which can severely shorten its lifespan. Then vegetation can begin growing in those cracks as well. As the roots of that vegetation get bigger, they can begin to push up on the surface of your asphalt which, as you can well imagine, is going to cause even more damage. Seal coating plays a very important role in protecting asphalt from the atmosphere and from ultraviolet rays which accelerate the deterioration of the asphalt. Seal coating is applied on the surface of the asphalt, and it can be applied either by a squeegee, broom, or machine. 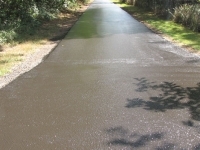 It is suggested that you apply seal coating every 2 years or so after paving depending on the condition of the asphalt. Seal coating also provides an appealing black surface that is superb for painting stripes or alternative markings. At Seal Pave we are a group of professionals knowledgeable in asphalt paving, striping, crack repair, and seal coating. We have years of experience and look forward to working with you on your next asphalt repair project.